This driving tour is a 220-mile self-guided journey through the historic mountain frontier of colonial America. The goal of the tour is to stamp your passport at each of 10 Passport Pit-Stops. 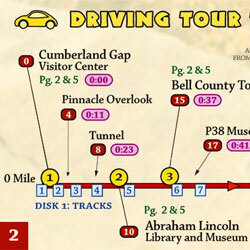 The tour visits the parks and museums along the Cumberland Gap and Kingdom Come Scenic Parkways.